For the second consecutive day, red lights emanating from tracer ammunition sparkle in the sky over Deir ez-Zor in celebration of the Syrian government forces’ significant breakthrough in the fight against terrorists. MOSCOW (Sputnik) — A Sputnik correspondent was among the few reporters to be at the front line with the Syrian army troops when the blockade of the airbase in eastern Deir ez-Zor was broken. Syria's Deir ez-Zor province was the largest hotbed of the most combat-ready units of the Daesh terrorist organization (banned in Russia). 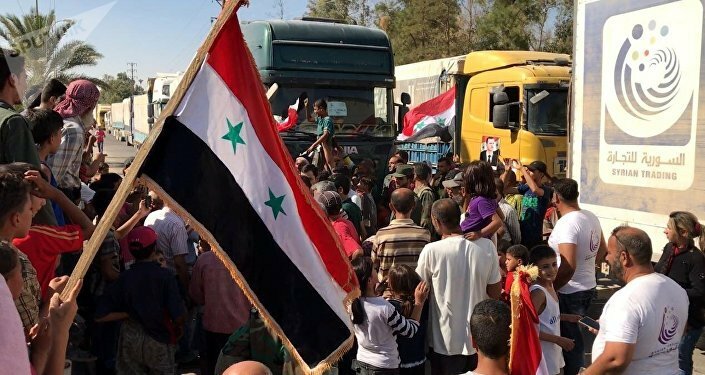 Terrorists of the so-called caliphate initially had the priority goal to take over the northern province of Syria and its administrative center. Deir ez-Zor was not a random choice. There are large oil and gas deposits in the province, as well as a significant number of state-owned factories. Now, Deir ez-Zor is attracting the remaining terrorist forces from all over Syria, mainly from Daesh's self-proclaimed capital of Raqqa. The major part of the province is still occupied by militants. 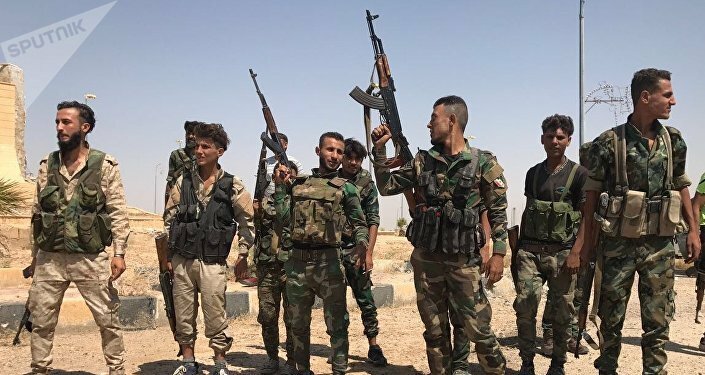 However, the terrorists failed to crush the resistance of Deir ez-Zor defenders. "With the support of Saudi Arabia and the West, Daesh fighters attempted to seize the city. But thanks to our strong will for freedom and victory, you can see now that all their plots and plans are falling apart like a house of cards," an officer from the Syrian army says over a cup of herbal tea as he points out the forces' positions on the map. Commanders of the assault troops are coordinating the airfield offensive at headquarters while terrorists’ shells explode 100 meters (328 feet) away. Fighters of the republican guard, led by Gen. Issam Zakhreddine, are advancing the attack along the city’s southern border leading to the airbase. The elite Tiger Forces are in the middle of a fierce battle with Daesh at two areas further to the east. "Terrorists did not expect such a confident offensive. They are used to our lack of ammunition. But today we have everything we need and our fellow fighters are with us," the guard officer says at the operation’s headquarters. The headquarters, which is outside a university dormitory, looks like an ordinary checkpoint, but it has sought-after, cold, drinking water. At 42 degrees Celsius (107.6 degrees Fahrenheit) water tastes sweet. If you walk through the trenches, it will only take a half hour to get from the headquarters to the combat field. We approach the fighters at the bottom of the Alloush hill, the bargaining chip in this battle. The militants, laying in an ambush above us, want to keep the strategic position as well. But the task was given, and Gen. Suheil’s soldiers, along with the republican guard, decide to storm the hill before sunset. The ammunition delivery is right on time. Less than two hours later, the injured commander reports with a smile that the dominant hill is retaken. During a staff meeting at night, the general announces that during the first day of the operation to unblock the airfield, three officers were killed and seven more were injured. The assault operation continued in the morning. Gen. Zakhreddine left us at the headquarters and led the assault troops straight to the airfield gate. Over the years of the siege and fighting against Daesh, the troops have discovered all the hidden trails that would allow them to avoid landmines. The airbase camp, which holds over one thousand people, has been under siege since January. The personnel had to ward off terrorists' attacks almost daily, hoping that the day will come when they can see their families again. The airbase troops did not sit up in shelters and set out to meet the republican guard forces. The terrorists were taken aback by this turn of events and were forced to flee, be it was already too late. After purging the remaining hills at the entrance to the airbase, the republican guard troops joined the airfield fighters at the checkpoint. "We are reunited, mission accomplished. But there is no road yet. We went through a minefield. Bomb technicians are on the way," the general reported on the radio as triumphant tracers shot up in the sky over the city. Deir ez-Zor celebrated throughout the night. Civilians who received first humanitarian aid congratulated each other and shared food. "Today we are expecting the fifth convoy from the southern road. I hope that soon my wife will be able to cook me something other than beans, if she can still remember how," one of the commanders at the headquarters said. Under siege for more than three years, Deir ez-Zor civilians have been receiving food by air. It was only possible to supply the minimum required for residents to survive. White beans were the main ingredient of all meals. However, according to a soldier, boiled beans were still a luxury in Deir ez-Zor, because cooking required gas, fuel or firewood. The first two were very expensive. A can of household gas cost at least $200. One liter of fuel cost about $6. Hunger and need, especially in winter, forced the locals to cut all of the already small number of trees in the area. When the last roots turned to ashes, doors and furniture followed. During the last months of the blockade, the people had to burn clothes to cook food. "What the Leningrad Siege was for you during World War II, the Deir ez-Zor blockade became for us," an officer describes their life in the besieged city. Despite the blockade having been broken through in the west, on September 5 the city residents and the military waited for the arrival of troops from the south through the main southern gates. Unblocking of the main road would mean opening the shortest route to Damascus and therefore allow for faster deliveries. Only yesterday, the main gates were controlled by Daesh and the road mined. The fifth corps’ column is standing several hundred meters away but cannot come closer yet. Mine clearance specialists continue to clear the area. Syrian television installed their satellite dishes and began a live broadcast of the historic event. Soldiers raise their guns and send their regards to their families via phone calls. "Do not film me, I have no family left. These beasts killed everybody. I have nobody to send a hello to," a tanned soldier covered in grime says. A wearying hour goes by until an offroader belonging to the fifth corps’ commander appears on the horizon. Generals of the Deir ez-Zor defense walk toward him and the soldiers meet halfway to triumphant cheering. In that moment, forgetting about danger, the soldiers run toward each other with tears in their eyes, giving each other congratulatory embraces. "These are tears of joy. I am from Deir ez-Zor and I swore that I would come back to my city down this very road on my own feet, not in a helicopter or a plane," Abu-Mahdi, an older soldier, said, wiping sweat and tears from his tanned face. The happy moment is darkened by an explosion several meters from the road. Two offroaders bypassing the main road struck a roadside mine right in front of the others. The shock wave hurled the soldiers out of the open carriage into a ditch. A minute later, it's revealed that one soldier was killed. Another one gets out of the car without a leg. The world stands still for a moment ringing in my ears. The newly-arrived convoy is soon dispersed at the stations in the city. Commanders gather for a meeting. In the next few days, chronicles of victories will continue in Deir ez-Zor. The government troops have to liberate the rest of the city, clear the airbase perimeter and continue liberating the provinces up to the last village at the border with Iraq.